It is already more than one week after the last day of the XXIII ISPRS Congress. The Congress lasted one week, from 12 – 19 July. Two members of the Local Programme Committee (both Ph.D. candidates) prepared a very successful Summer School in the historical city of Telč, for 40 participants, one week before the Congress. Other events before the Congress were the Tutorials. The Congress program consisted of plenary sessions, with nine carefully selected speakers from all over the world, parallel and interactive sessions. Parallel and interactive sessions offered more than 1600 presentations submitted by ISPRS members. The 186 oral sessions began on 13 July and ended on 19 July. More than 40 % of papers (650) were presented at interactive sessions. For the first time, the scientific part was managed in cooperation between the Local and International Program Committees. The International Program Committee was based on Technical Commission Presidents (TCPs) and their two or three colleagues according to their decisions. International Program Committee members were responsible for the reviewing process, together with their Working Groups (WGs). The Local Program Committee (LPC) members monitored the whole process, cooperated with WG Chairs and TCPs in case of any problems, helped with the evaluation, with questions and software where necessary, and controlled the whole procedure according to the time schedule and review procedure. The last and very important role of the LPC was during the Congress – the permanent control of availability of individual session chairs and their replacement if they were not able to be present. I would like to express my great gratitude for the work of both Committees, but especially the LPC. Auletris, the Professional Congress Organizer brought new ideas to the Congress. One of them was the Congress TV, which offered morning reports and interviews, from the previous day, to all participants. Auletris also prepared an ice-breaking party for young participants in the middle of the week and a Fun Run before the Opening Ceremony and the social program as such. They have also distributed a digital Newsletter regularly since the Prague Congress bid preparation in 2011. The other regular information source during the Congress, was the Congress Daily newspaper, produced by GIM, both in a digital and printed version and available every morning. The Congress Daily also informed participants about the ISPRS General Assembly meetings. Auletris also prepared the recording of the keynote presentations, plenary sessions and Fora. Videos of the keynote speakers are available at the Congress web site, the rest will be available after the approval of individual speakers. I would like to express my deepest appreciation to all members of the Czech Society for Photogrammetry and Remote Sensing for their huge support, and to all who helped during the preparation and throughout the Congress. We have been receiving many positive emails, and comments on Facebook and Twitter, which belong to all of us. Thank you very much. 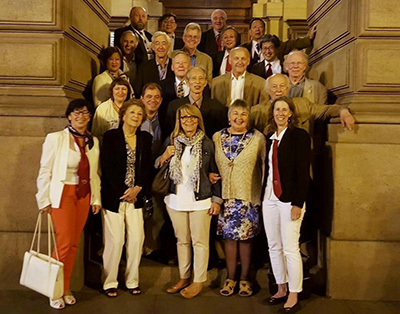 The ISPRS Foundation (TIF), a non-profit entity established in 2003 and managed by a Board of Trustees responding to ISPRS grant needs that are identified by the ISPRS Council, was very active in the ISPRS Congress held 12-19 July 2016 in Prague, Czech Republic (http://www.isprs.org/foundation). 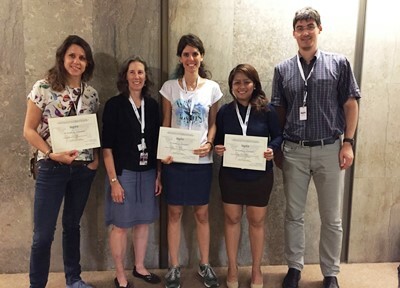 A total of 48 students and regional representatives largely from developing countries and demonstrating activity in the Congress by presenting research and/or participating in the General Assembly were selected to receive ISPRS/TIF Travel Grants financially supported by ISPRS and TIF donations. A total of 12 students received TIF Travel Grants and waived registration fees donated by the Czech Society for Photogrammetry and Remote Sensing (SFDP), and 18 students also were granted waived registration to the Congress by the SFDP. Considering all of these TIF Travel Grants and the value of the waived registration fees, over 60 individuals received over $60,000 by ISPRS, TIF and SFDP to participate in the 2016 Prague Congress. Further support was provided by ISPRS and TIF for the Pre-Congress Summer School, Natural Resource Management: From data processing to web publishing. 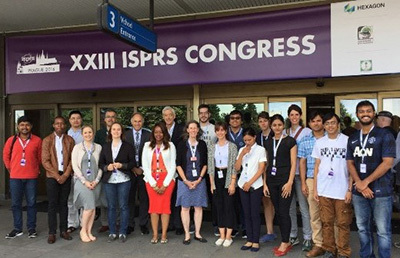 Additional White Elephant Travel Grants totaling $3,775 were awarded to three participants of the ISPRS Prague Congress: Ayda Akkartal, Ivan Detchev and Sheryl Rose Reyes, all active in the ISPRS Student Consortium. The ISPRS White Elephant (WE) Club (a group of senior members of ISPRS who mentor young scientists) initiated these WE Travel Grants in honor of the memory of Kennert Torlegård, Professor of Photogrammetry at the Royal Institute of Technology (KTH), Stockholm, Sweden. Professor Torlegård was the Technical President of Commission V, Close Range Photogrammetry (1976-1980), Secretary General (1984-1988), President (1988-1992) and First Vice President (1992-1996) of ISPRS, as well as a founding member of the White Elephants Club. The TIF and Prague Local Organizing Committee organized a White Elephants Club dinner during the Congress to thank members for their pledged donations and to welcome Prague Congress Director, Dr. Lena Halounová, as the newest member of the White Elephants Club. After 10 years of excellent leadership, Professor Dr. –Ing. Dieter Fritsch, former Head of the Institute for Photogrammetry at Stuttgart University, will end his tenure as Chair of The ISPRS Foundation (TIF). 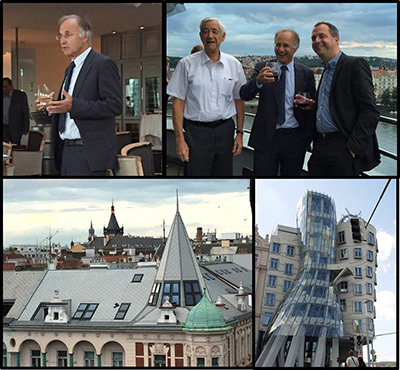 Prof. Fritsch announced his TIF Chair retirement at a TIF fund raising dinner held during the Prague Congress at the elegant Ginger & Fred Restaurant atop the Dancing House. The uniquely modern building was built in 1992-1996 with curving outlines that reminded its architects of the famous dancing couple from classic movies of the 1930s. During the announcement, Prof. Fritsch welcomed Stewart Walker of BAE Systems, Inc. as the new TIF Chair. He also briefly summarized TIF achievements during the previous 4-year term. Over $160,000 of grants have been awarded since 2012 in the form of TIF Travel Grants, support for ISPRS Student Consortium and 3S Summer Schools and prestigious awards presented at the Congresses including the Brock Gold Medal, Wang Zhizhou, CATCON, Frederick J. Doyle and IGI Africa Ambassador Awards. At the General Assembly, held during the XXIIIrd ISPRS Congress, in Prague, Nicolas Paparoditis was elected Congress Director after his bid and won the election to host the XXIV ISPRS Congress in Nice, France. Congratulations, Nicolas! Council would like to express its thanks to the Canadian and Dubai teams for the huge effort put into their bids and for their interest in hosting a congress for the society. The fact that three bids were received reflects the team spirit and enthusiasm within the society which was perceptible throughout the Congress. Thanks also go to those organisations whose bids were not successful. An individual is elected as an Honorary Member in recognition of distinguished services to the ISPRS and its aims. Honorary Members shall be nominated by a committee and elected by the Congress. Orhan Altan first made his mark on ISPRS as Congress Director in 2004 and has since held many roles and responsibilities within the Society, including President from 2008- 2012, and from 2012-2016 he served as 1st Vice President. Council expresses its extreme gratitude to Orhan for his dedication to the Society while bidding him farewell at the end of his term of office. Orhan Altan has introduced a number of important initiatives into ISPRS including the establishment of the Student Consortium which laid the basis for attracting more young scientists into the society; he was instrumental in setting up an agreement to have the ISPRS proceedings published in a professional way and has thus provided the necessary quality of these proceedings to be included into major indexing databases such as the Web of Science and SCOPUS; he has worked with the Joint Board of Geospatial Societies (JBGIS) and the UN Office of Outer Space Affairs to produce booklets on the value of geospatial information for disaster management. Orhan Altan has represented ISPRS on many international bodies including the International Council for Science (ICSU) and has served on the Executive board of ICSU which has raised the recognition and standing of ISPRS internationally. Orhan Altan’s contribution has been not only as an officer of the Society, he has also made a significant research contribution to ISPRS Commissions and Working Groups throughout his career, which has covered major developments in both photogrammetry and remote sensing. Outside of ISPRS, Orhan Altan has had a distinguished academic career as a professor of photogrammetry at the Istanbul Technical University and has an extensive list of refereed publications and conference papers. Orhan Altan is fluent in English and German, as well as Turkish and this has enabled him to build bridges across Europe and Asia. His contribution to the development and long term sustainability of ISPRS and his distinguished academic achievements combined with his diplomacy and charm, make Orhan Altan a very deserving candidate for election as an ISPRS Honorary Member. Franz Leberl was the founder of Vexcel Corporation (1985, Colorado) and of Vexcel Imaging GmbH (1993, Graz, Austria). He withdrew from business with the 2006-sale of Vexcel to Microsoft and worked at Microsoft as Director of Virtual Earth and Bing-Maps evangelist from 2006-2007. He has 377 publications and 15 patents, and has served as 1st doctoral referee to 48 graduates. His honours include IEEE-Fellow 1996; Grand Decoration of Honour in Silver for Services to the Republic of Austria (2006); Outstanding Technical Achievement Award from the American Society of Photogrammetry and Remote Sensing (2012); Brock Gold Medal from the International Society for Photogrammetry and Remote Sensing (2012); Friedrich-Hopfner Gold Medal from the Austrian Geodetic Commission (2014); Honorary Senator of the University of Ljubljana, Slovenia (2015). The Brock Gold Medal Award, donated by the American Society for Photogrammetry and Remote Sensing, is awarded for an outstanding landmark contribution in the evolution of the photogrammetry, remote sensing and spatial information sciences, which is a proven contribution to these sciences and technologies of whatever form, whether a major completed project or program, some fundamentally new equipment, system or fundamentally new technique, or other new departure. The 2016 awardee is Wolfgang Förstner, for his outstanding scientific achievements in the fields of photogrammetry and computer vision. He is an internationally leading expert in photogrammetry, computer vision, pattern recognition and machine learning. After obtaining a degree in geodesy he started his career at the Institute for Photogrammetry, University of Stuttgart. At this point of time, the institute, headed by Prof. Ackermann, was a renowned international centre for photogrammetry, in particular in aerial triangulation. In his dissertation, which he completed in 1976, Förstner concentrated on blunder detection in photogrammetric blocks; his results still prevail. Förstner then devoted his research to the problem of image matching which was highly topical with the first-time availability of digital images. His work was pioneer in digital photogrammetry world-wide. Papers on Least Squares Matching presented at the 1984 ISPRS Congress and on an Interest-Operator, later named the Förstner Operator, at the 1986 ISPRS Symposium are, to this day, recognized as groundbreaking. Almost all systems, which have proven themselves in the practical world, are based on either LSM, the Förstner-Operator or variants thereof. After his appointment to the professorship of photogrammetry at Bonn University in 1990 Förstner became interested also in pattern recognition and computer vision. Work on building reconstruction from aerial images formed his scientific focus for the following years resulting in many scientific publications but also in the commercial program system inJect. Many other areas of interest of Wolfgang Förstner and many more of his achievements could be mentioned. Suffice it to say that throughout his exemplary career of nearly 40 years as a researcher, inventor, innovator and educator, he has made exceptionally significant scientific contributions in many areas of Information from Imagery and mentored generations of mapping scientists and engineers. Although now formally retired since 2012, he continues his scientific activities. The Otto von Gruber Award, which is donated by the Netherlands Center of Geodesy and Geo-information (NCG), consists of a medal and a monetary grant, and is presented to the author, under 40 years of age, of a paper of outstanding merit in the photogrammetry, remote sensing and spatial information sciences published during the 4 years prior to the Congress. The recipient of the award is Wai Yeung Yan with regard to his ground breaking development of radiometric correction and normalization of LiDAR sensor data published in a series of papers. Wai Yeung Yan was born 1980 in Hong Kong. He received his B.Sc. (Hons) in Surveying and Geo-informatics at Hong Kong Polytechnic University in 2002 and M.Sc. in Business Information Technology at Middlesex University, London, in 2006. He later on moved to Toronto, Canada to pursue his Ph.D. in the Department of Civil Engineering, Ryerson University in 2008. With his exceptional academic and research achievements, he was presented with the prestigious Governor’s General Academic Gold Medal during his graduation in 2012. He is currently a postdoctoral fellow at Ryerson, and continues to carries on research in LiDAR remote sensing. Wai Yeung Yan has proposed and developed radiometric correction and normalization models to improve the quality of airborne LiDAR intensity data. His models consider various system and environmental induced distortions, and adjust the radiometric misalignment found in the overlapping LiDAR data strips. His proposed algorithms can significantly improve the signal-to-noise ratio and reduce striping noises when mosaicking multiple LiDAR data strips. He has also demonstrated how the corrected and normalized LiDAR intensity data can aid in improving the classification accuracy in different land cover scenarios. His contribution, being interdisciplinary and of practical relevance, has laid a foundation for the next generation global land cover mapping, and can be seen as an essential pre-processing step prior to LiDAR data classification. Yan, W.Y., Shaker, A., Habib, A., Kersting, A.P. 2012. Improving classification accuracy of airborne LiDAR intensity data by geometric calibration and radiometric correction. ISPRS J. Ph&RS 67, 35-44. Yan, W.Y., Shaker, A. 2014. Radiometric correction and normalization of airborne LiDAR intensity data for improving land cover classification. IEEE Transactions on Geoscience and Remote Sensing, 52(2), 7658-7673. Yan, W.Y., Shaker, A. 2015. Radiometric normalization of overlapping LiDAR intensity data for reduction of line striping noise. Int. J. Dig. Earth. Published: Nov. 26, 2015. Yan, W.Y., Shaker, A., El-Ashmawy, N. 2015. Urban land cover classification using airborne LiDAR data: a review. Rem. Sens. of Environment, 158, 295-310. Yan, W.Y., Morsy, S., Shaker, A., Tulloch, M. 2015. Automatic extraction of highway light poles and towers from mobile LiDAR data. Optics & Laser Technology. Published: Sept. 26, 2015. The U.V. Helava Award is a prestigious ISPRS Award, which was established in 1998 to encourage and stimulate submission of high quality scientific papers by individual authors or groups to the ISPRS Journal, to promote and advertise the Journal, and to honour the outstanding contributions of Dr. Uuno V. Helava to research and development in photogrammetry and remote sensing. The award consists of a monetary grant of 10,000 SFr., certificates and a silver plaque. It is sponsored by Elsevier B.V. and Hexagon Geosystems, while the Institute of Photogrammetry and Remote Sensing, Aalto University (the University where Helava studied) donates half the costs for the silver plaque. The plaque was designed by the 1980-88 ISPRS Technical Commission III President, Einari Kilpelä, previously professor at the Helsinki University of Technology. For 2012: "CityGML – Interoperable semantic 3D city models"
For 2013: "Urban accessibility diagnosis from mobile laser scanning data"
For 2014: "Indoor scene reconstruction using feature sensitive primitive extraction and graph-cut"
The Samuel Gamble Award is sponsored by the Canadian Institute of Geomatics in honour of Dr. Samuel G. Gamble, former President of ISPRS, and Director of the 1972 Congress. A recipient of the award shall be a person who, like Dr. Gamble, has contributed significantly to the development, organization or professional activities of the photogrammetry, remote sensing and spatial information sciences, at the national or international level. The recipient of the Award is Naser El Sheimy in recognition of his role as a leading international researcher in Geomatics and Mobile Mapping. Naser El Sheimy is Professor and former Head of the Department of Geomatics Engineering, the University of Calgary. He held a Tier-I Canada Research Chair (CRC) in Geomatics Multi-Sensor Systems and is the scientific director of TECTERRA Centre of Excellence for Commercialization and Research. His research expertise includes Geomatics multi-sensor systems, GPS/INS integration, and mobile mapping systems. Naser El-Sheimy published two books, 6 book chapters and over 450 papers in academic journals, conference and workshop proceedings, in which he has received over 30 national and international paper awards. He supervised and graduated over 65 Masters and Ph.D. students. He is the recipient of many national and international awards including the ASTech “Leadership in Alberta Technology” Award the Association of Professional Engineers, Geologists, and Geophysicists of Alberta (APEGGA) Educational Excellence. From 2008-2012, El-Sheimy was the president of Commission I on "Sensors and Platforms" of ISPRS. He organized and participated in organizing many national and international conferences and chaired many conferences such as the USA Institute of Navigation Global Navigation Satellite Systems (GNSS) and Mobile Mapping Symposium. Naser El-Sheimy is currently a member of the Editorial Board of the Journal of Survey Review, the Journal of Applied Geodesy, the MDPI Journal on Sensors and on Coordinates. He served as a member of the Alberta Geomatics Group Board of Directors, Geoide NCE Board of Directors and chaired many international working groups. He commercialized a number of multi-sensor systems technologies through the University of Calgary Commercialization office and is the founder of three successful companies on sensors and platforms for mapping and navigation applications. The Willem Schermerhorn Award (1988), sponsored by Geo-Information Netherlands is granted to a person who has most significantly contributed to the activities of a Working Group of the ISPRS during the four year Congress period. The award consists of a certificate and has been awarded to Uwe Stilla for organising extremely worthwhile and successful scientific meetings of a very high level and in particular the PIA workshop series. Uwe Stilla was born in Cologne, Germany, in 1957. He received the Diploma (Dipl.-Ing.) degree in electrical engineering from University of Paderborn, Germany, the Diploma (Dipl.-Ing.) in biomedical engineering and the Ph.D. (Doctor of Engineering) degree in pattern recognition from the University of Karlsruhe, Germany, in 1980, 1987, and 1993, respectively. From 1990 to 2004, he was with the Research Institute of Optronics and Pattern Recognition (FGAN-FOM), Ettlingen, Germany. Since 2004, he is Professor with the Technische Universität München, Germany, and the Head of the Department of Photogrammetry and Remote Sensing. He was the Vice Dean of the Faculty of Civil, Geo, and Environmental Engineering and is currently the Dean of Studies of the Bachelor’s and Master’s Programs Geodesy and Geoinformation, Earth Oriented Space Science and Technology (ESPACE) and Cartography. His research interests include image analysis in the field of photogrammetry and remote sensing. The publication list of Uwe Stilla shows more than 350 entries. Uwe Stilla is the Chair of the ISPRS Working Group III/VII “Pattern Analysis in Remote Sensing”, is a Principal Investigator of the International Graduate School of Science and Engineering (IGSSE), the Vice President of the German Society of Photogrammetry, Remote Sensing and Geoinformation (DGPF), a member of the Scientific Board of German Commission of Geodesy (DGK), and a member of Commission for Geodesy and Glaciology (KEG) of the Bavarian Academy of Science and Humanities, Munich, Germany. He has been the organizer and the chair of many ISPRS and IEEE conferences and events. The Schwidefsky Medal is sponsored by the German Society of Photogrammetry, Remote Sensing, and Spatial Information (DGPF), in memory of Professor Dr. rer. techn. Dr.-Ing. e.h. Kurt Schwidefsky, Honorary Member of the ISPRS. The Award is in the form of a medal made of porcelain. The recipients shall be persons who have made significant contributions to photogrammetry and remote sensing, either through the medium of publication as author or editor, or in another form. The Schwidefsky Medal is awarded to Charles K. Toth for his significant contributions to the field of photogrammetric theory and practice in the last three decades and Clément Mallet for his many contributions to photogrammetry and remote sensing as the editor of the Revue Française de Photogrammétrie et Télédétection and as Program Chair for the Geospatial Week 2015 in La Grande Motte. Charles K. Toth is a Research Professor in the Department of Civil, Environmental and Geodetic Engineering, at The Ohio State University (OSU). He received a M.Sc. in Electrical Engineering and a Ph.D. in Electrical Engineering and Geo-Information Sciences from the Technical University of Budapest, Hungary. His research interest and expertise cover broad areas of spatial information sciences and systems, including photogrammetry, multi-sensor geospatial data acquisition systems, LiDAR, high-resolution imaging, surface extraction, modelling, integrating and calibrating multi-sensor systems, georeferencing and navigation, 2D/3D signal processing, and mobile mapping technologies. He has published over 300 peer-reviewed journal and proceedings papers, and is the recipient of numerous awards, including the 2009 APSRS Photogrammetric Award and the United States Geospatial Intelligence Foundation (USGIF) Academic Achievement Award 2015. Acknowledged internationally for his visionary contributions to mobile mapping, he was a key architect of the concept development, and conducted significant research in areas of sensor georeferencing and digital imaging technologies. He is credited with the introduction of the term “direct and indirect georeferencing” in the photogrammetric community. He is very devoted to education and mentoring the next generation of the photogrammetric professionals, and has been a major contributor to annual Summer Schools on mobile mapping held internationally. Charles is highly respected across the international mapping community and has held many senior leadership positions in national and international societies. He is currently President of the American Society of Photogrammetry and Remote Sensing, and served as the ISPRS Commission I President from 2012 to 2016. Clément Mallet is a permanent researcher at the French National Institute of Geographic and Forest Information (IGN) since 2005, where he is responsible for the research team on scene interpretation and reconstruction, with a focus on land-cover mapping. He received the Master of engineering degree from École Nationale des Sciences Géographiques, France (2005), the M.Sc. degree in physics in remote sensing from Université Paris 6, France (2005), and the Ph.D. degree in image and signal processing from Telecom ParisTech, France (2010), on full-waveform lidar data processing. Clément served as Technical Commission III secretary (2008-2012), Chair of the ISPRS Working Group III/3 (Image Sequence Analysis, 2012-2016) and Program Chair of ISPRS Geospatial Week 2015. He co-organised ISPRS workshops in various conferences since 2010 and will be technical co-chair of JURSE 2017. He served as the Editor-in-Chief for the French Journal of Photogrammetry and Remote Sensing (RFPT) between 2011 and 2015. He now serves in the Editorial Board of RFPT, Photogrammetric Engineering & Remote Sensing, and in the Editorial Advisory Board of the ISPRS Journal of Photogrammetry and Remote Sensing. The Eduard Doležal Award is donated by the Austrian Society for Surveying and Geoinformation to assist individuals or representatives of institutions from deve­loping or reform countries to participate in the ISPRS Congress. The 2016 recipient is P.V Radhadevi. The Eduard Doležal Award is given to P.V. Radhadevi for her sustainable work on mapping topography and land cover from high resolution satellite imagery. Her work impressively reaches from sensor modelling and calibration to 3D reconstruction, always in consideration of practical applications. P.V. Radhadevi is a senior scientist at the Advanced Data Processing Research Institute (ADRIN), Department of Space (Government of India), where she heads the Digital Mapping Division. P.V. Radhadevi joined ADRIN in 1989. She was a pioneer in conceptualizing satellite imaging geo­metries and using satellite photogrammetry as a prominent tool for mapping. Her contribution to the Orbit attitude modelling with a single GCP was a break through. This innovative idea made value addition in satellite imagery cost-effective, which had a big impact on product generation practices. She proved many new concepts, such as full pass image rectification, combined CCD adjustment, geo-integration of sensors, tied-camera approach, multi-sensor bundle block adjustment etc. The bundle block adjustment package designed by her, which can handle hundreds of heterogeneous satellite/sensor images simultaneously, delivers end-to-end solution with complete automation. In-flight calibration of sensors is another area of her interest. She has over 40 technical publications in reputed journals, and is a recipient of many awards including the ISCA Young Scientist Award (1989), President of India Cash Award (1989) from ISTAM, ASI Space Gold Medal (2000), ASI Woman Scientist Award (2009), ISRO Team Award (2009 & 2012), etc. In the year 2009, she was selected for the DLR-DAAD senior research fellowship. She was an Invited Speaker for IEEE-IGARSS conference in 2012. P.V. Radhadevi has been actively involved, for the last 27 years, in the area of satellite photogrammetry and has been instrumental in bringing out the potential of Cartosat series of satellites for large scale mapping in India. The Wang Zhizhuo Award is sponsored by the Chinese Society of Geodesy, Photogrammetry and Cartography (CSGPC) and consists of a medal and a monetary grant. It will be granted at each quadrennial ISPRS Congress to a person who has made significant achievement or innovation in the spatial information sciences. The recipient of the Award is Andrew Hudson-Smith on the basis of his work to develop and promote the Internet of Things and his major international contribution to spatial information science. Andrew Hudson-Smith is Professor and Director of the Centre for Advanced Spatial Analysis (CASA) at University College London. Andy holds a Chair in Digital Urban Systems and is Editor-in-Chief of Future Internet Journal; he is also an elected Fellow of the Royal Society of Arts, a member of the Greater London Authority Smart London Board and Course Founder of the M.Res. in Advanced Spatial Analysis and Visualisation at University College London. Andy is also course founder of the MSc in Smart Cities and Urban Analytics and the M.Res. in Smart Cities at CASA. He oversees 20 research associate staff, is directly responsible for 7 lecturing staff, 2 Professors and 12 Ph.D. students. Total personal grant income from 2009 exceeds £15.5 million with projects across multiple sectors and disciplines. He is also a member of the All Party Parliamentary Group on Smart Cities. With a focus on key research around smart cities, smart spaces, 3D visualization, digital communication and the Internet of Things, his work has featured widely in the media including, Sky Television, The New York Times, The Guardian and most recently, The One Show, Channel 4 News, New Scientist, Wired, ABC Australia, The Japan Times, BBC Radio 4 and BBC Radio 5. The Karl Kraus Medal, sponsored by the German Society of Photogrammetry, Remote Sensing, and Spatial Information (DGPF), the Austrian Society of Surveying and Geoinformation (OVG), and the Swiss Society of Photogrammetry and Remote Sensing (SGPF), is awarded to authors of excellent textbooks in the fields of photogrammetry, remote sensing, and spatial information sciences, published no more than eight years prior to the commencement of the ISPRS Congress at which it is to be awarded. The medal is awarded to Ian Dowman, Karsten Jacobsen, Gottfried Konecny and Rainer Sandau for their textbook High Resolution Satellite Imaging. The decision was based on the presentation and up-to-dateness of the material, its structure and accessibility for students, as well as the thorough treatment of the subject. From 1964 to 1967, Ian Dowman was employed as Photogrammetrist at the Hydroelectric Commission of Tasmania, Australia, and from 1967 to 1969, he worked as technical manager of Mapmakers, in Sydney. He then moved to London where he was Lecturer, Reader and Professor, at the University College London from 1970 to 2009. In 1981, Ian received his Ph.D. at the University of London, and in 1986 he became a Fellow of the Royal Institution of Chartered Surveyors (FRICS). From 1997 to 1999 he was Dean of Engineering at the University College London. From 1996 to 2000 Ian Dowman was President of ISPRS Commission II, and from 2000-2012 ISPRS Council member and ISPRS President. Since 2012, he is an Honorary Member of the ISPRS. Ian Dowman is Emeritus Professor of Photogrammetry and Remote Sensing, University College London, since 2009. In 1971, Karsten Jacobsen received his diploma in Surveying Engineering, and was employed at the University of Hannover, Institute of Photogrammetry and Geoinformation, from 1974. In 2009 Karsten retired as Academic Director, but he is still active in the field. His doctor thesis was on bundle block adjustment, with his major topics of research in numerical photogrammetry, especially orientation and calibration of aerial and space imagery, DEM generation and analysis, and mapping with aerial and space images. He is author of the program system BLUH. He has headed cooperation projects and given technical courses in several countries, and has more than 300 publications. Karsten Jacobsen was Co-chair of WG I/4 “Geometric and Radiometric Modelling of Optical Spaceborne Sensors”, Co-chair of EARSeL Special Interest Group “3D-Remote Sensing”, Co-chair of the Working Group “Sensors and Platforms” of the German Society of Photogrammetry and Remote Sensing and is an Honorary member of EARSeL. Educated as Surveying Engineer at the Technical University of Munich, Germany, Gottfried Konecny continued his career as a Fulbright scholar at The Ohio State University from 1954 to 1956. In 1959, he received his doctorate at the Technical University Munich, and was employed by University of New Brunswick, Canada, where he launched the first English language program in Surveying Engineering. In 1971, he accepted a professorship at the University of Hannover, in Germany. In 1975, Konecny made the proposal to DLR and ESA to launch a Zeiss Metric Camera on the First European Spacelab Mission. From 1984 to 1988 he was President of ISPRS and from 1993 to 1997 Chairman of EARSeL. Gottfried Konecny is author of several books: on Photogrammetry 1984, in German, and on Geoinformation 2003 and 2014. He has four honorary doctorates and about 300 publications, and is Emeritus Professor since 1998. Retired from the German Aerospace Center (DLR), Rainer Sandau currently acts as adjunct Professor at Baylor University, Texas, USA, and Director of Satellites and Space Applications at the International Academy of Astronautics (IAA). During his career he held various positions, including Deputy Director of the Institute of Space Research in Berlin, Germany, and Director R&D of LH Systems. He has over 30 years of experience in airborne and spaceborne activities and has led and been involved in instrumentations of four space missions to Venus, Mars and Earth. His stereo camera, WAOSS (Wide-Angle Optoelectronic Stereo Scanner), developed for the Russian Mars 96 mission, also flies on DLR’s micro satellite BIRD and was also used as the basis for the technology transfer to develop Leica’s ADS 40. He has chaired the ISPRS International Advisory Committee (IPAC) and has represented ISPRS at the UN COPUOS. The Frederick J. Doyle Award is awarded to an individual who has made significant accomplishments in advancing the photogrammetry, remote sensing and spatial information sciences and technologies. A recipient of the award should typically be less than 50 years of age and have outstanding stature within the ISPRS community. The award consists of a silver medal and a monetary grant. The Frederick J. Doyle Award 2016 goes to Wolfgang Wagner, TU Vienna, for his outstanding scientific contributions in active remote sensing, combined with his strong leadership role in science management, university administration and in international organisations. Wolfgang Wagner was born in 1969 in Wels, Austria. After studies in Physics, at TU Vienna, he received a Ph.D. degree in remote sensing in 1999. Following a short period at DLR, Germany, he was appointed to a professorship of remote sensing at TU Vienna in 2001. From 2006-2011 he was Head of the Institute for Photogrammetry before moving to his current position as Department Head. Wolfgang Wagner is one of the leading scientists in physical modelling and geophysical parameter retrieval from remote sensing data, in particular radar and lidar measurements. He was coordinator of the Austrian Christian Doppler Laboratory for "Spatial Data from Laser Scanning and Remote Sensing" for 7 years, initiated the ESA Climate Change Initiative project on soil moisture in 2011, and serves on various advisory boards of international space projects. He was also a co-founder of the Earth Observation Data Centre for Water Resources Monitoring (EODC), acting as head of science since December 2014. Within ISPRS, Wolfgang Wagner was President of Technical Commission VII from 2008-2012 and initiated a number of significant reforms and new activities within the society during that time, including the new open source International Journal for Geo-Information, the establishment of the ISPRS Archives and Annals as an open access series, and the establishment of management facilities for orga­nisers of scientific meetings. Wolfgang Wagner was also instrumental in organising the 100th anniversary of ISPRS which took place in Vienna in 2010. Since 2012 he is an active member of the ISPRS Scientific Advisory Committee. The Giuseppe Inghilleri Award (2012), sponsored by the Italian Society for Surveying and Photogrammetry (SIFET) is presented to a person who has significantly enhanced the applications of photogrammetry, remote sensing or spatial information sciences in the 4 years preceding the Congress. The award consists of SFr 2,500 and a certificate. The recipient of the award is Sander Oude Elberink for his high quality and innovative research in 3D landscape modelling that has successfully been transferred to practice to serve the society. Sander Oude Elberink graduated as Geodetic Engineer from Delft University of Technology in 2000, and finished his Ph.D. on the Acquisition of 3D Topography in March 2010. After his master research on the classification of airborne laser scanner data, he joined the Section of Photogrammetry and Remote Sensing in Delft as researcher on 3D reconstruction from line scanner imagery. From 2001 till 2005, he worked as research consultant and project manager at the Survey Department of Rijkswaterstaat, Ministry of Infrastructure and Environment. In September 2005, Oude Elberink started his Ph.D. research on "Acquisition of 3D Topography" at the Faculty of Geo-Information Science and Earth Observation (ITC) at the University of Twente. He received a young author's award for best papers at the ISPRS Congress in Beijing, China, in 2008. In 2009, Sander received the ITC research award for a journal paper on 3D road reconstruction, which was co-authored by George Vosselman and published in the Photogrammetric Record. Since September 2009, Sander holds a position of assistant professor at the department of Earth Observation Science at ITC. His research interests focus on 3D modelling and information extraction from point clouds. From 2012 to 2016, Sander chaired ISPRS Working Group III-2 on Point Cloud Processing. A Declaration ratified by delegates at the XXIII ISPRS Congress calls on international communities to work together and promote multi-disciplinary collaboration towards providing reliable geospatial information to support societal transformations towards global sustainability. This statement emphasizes the ISPRS commitment to realize the full potential of information from imagery through research and development, scientific networking, international co-operation, inter-disciplinary integration and education and training. The declaration proposes advancement of a global geospatial information framework/ infrastructure to be formed through collaboration between ISPRS and other international communities. The Declaration was made at the General Assembly of ISPRS at its XXIII Congress held in Prague, Czech Republic, in July 2016. 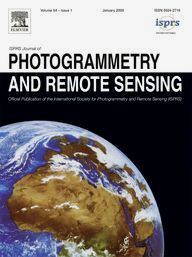 We, the members of The International Society for Photogrammetry and Remote Sensing (ISPRS) and participants of the XXIII ISPRS Congress in Prague, recognize the ever increasing application of imagery in many aspects of life and work today, and the urgent demands on deriving scientific evidence from imagery to monitor and understand global change, support sustainable development and confront global problems. the International Council of Scientific Unions (ICSU) GeoUnions and the Joint Board of Geospatial Information Societies (JBGIS) have decided to work together in connecting geospatial communities with decision makers. a collaborative global geospatial information framework/ infrastructure can provide high quality information from imagery to enable advanced geospatial computing and support collaborative problem solving. confront global problems such as environmental change, pandemics, natural and anthropogenic disasters, displaced populations, malnutrition, water shortages, rising ocean levels, and many others. At the DGPF-OVG-SGPF-Three-Country-Meeting in June 2016 in Berne, Switzerland, the DGPF general assembly elected a new president and vice-president: after four years Uwe Stilla, TU Munich, formerly DGPF vice-president, took over the presidency from Thomas Kolbe, whereas Uwe Sörgel, Stuttgart University, will serve as vice president. The board is completed by Eberhard Gülch as Secretary General, Wolfgang Kresse as Editor-in-Chief, PFG and Herbert Krauß as treasurer, who were all re-elected for another term. ISPRS congratulates Uwe Stilla on his new position. Uwe has collaborated closely with ISPRS for many years, is the driving fore behind the Photogrammetric Image Analysis series of events and has represented DGPF at the recent Congress in Prague. He was also the recipient of the ISPRS Schermerhorn Award 2016 for excellence in conducting an ISPRS workging group. Thanks go to Past President Thomas Kolbe for the cooperation during his term of office and to DGPF for the continuing support of ISPRS. Thomas Luhmann, Executive Director of the Institute for Applied Photogrammetry and Geoinformatic (IAPG) of the Jade University of Applied Sciences Oldenburg, was recently honoured with the academic degree of honorary doctor by the National University for Construction and Architecture (KNUCA) in Kiew, Ukraine. Thomas Luhmann is active in ISPRS since 1996 as Chairman and Co-Chairman of ISPRS Commission V working group V/1 vision metrology systems. As the former president of the German Society for Photogrammetry, Remote Sensing and Geoinformation, he represented Germany within the ISPRS General Assembly. In 2010 he was awarded with the ISPRS Karl Kraus Medal. Oldenburg.Kiew. Thomas Luhmann, Executive Director of the Institute for Applied Photogrammetry and Geoinformatic (IAPG) of the Jade University of Applied Sciences Oldenburg, was recently honoured with the academic degree of honorary doctor by the National University for Construction and Architecture (KNUCA) in Kiew, Ukraine. Thomas Luhmann was awarded due to his longtime engagement for the intensification of international contacts, modernisation of curricula in geoinformation sciences, regular guest lectures in photogrammetry and laserscanning, establishment of a computer lab, exchange of scientists and an annual joint project with students of both universities. Since 2011 Luhmann has initiated an intensive cooperation with KNUCA. Besides joint project proposals in Tempus, Erasmus and German research programs, teaching aspects were specifically addressed. As one example, a concept was created for educating Ukrainian teachers in modern hardware and software systems in order to establish joint courses with theoretical and practical contents. On this basis, an annual block seminar for photogrammetry and laserscanning has been created in 2014, and a joint student project as well. In this two-week project one week is spent in Kiew where mixed Ukrainian-German groups are planning and conducting field work for the subsequent 3D modeling of a complex building. The second week is spent in Oldenburg for data processing and final presentation of results. Since the foundation of KNUCA in 1930 only six degrees of honorary doctor were awarded. Thomas Luhmann is the first foreign scientist who was honored. ACRS 2016 will jointly be organized by the Local Organizing Committee of Sri Lanka and Asian Association on Remote Sensing (AARS). Makerere University together with other organizations and institutions in Uganda are taking the local lead in organizing the conference. The gist of the conference is to learn from ongoing technological advancements and applications and to explore modalities of galvanizing space science and geospatial technologies into policy and evidence-based decision making that will contribute to the realization of the Sustainable Development Goals (SDG’s), especially for Africa. Rodríguez-Cuenca, Borja, García-Cortés, Silverio, Ordóñez, Celestino, Alonso, María C.
Alqurashi, Abdullah F., Kumar, Lalit, Al-Ghamdi, Khalid A.